How can we strengthen faith formation classes? “If God loved us, why would he give my mom cancer?” asked a 12-year-old girl when prompted to write down one major question she had about God. Other students asked: Why does God so easily send us to hell? Will God still accept me if I’m gay? Why do only some people receive miracles? Why do we need God? As teachers at a coeducational Catholic prep school in Minnesota, we often encounter such questions as we talk about faith with our students. Teachers, parents and catechists in parish faith formation programs always hope that we can answer questions about God appropriately. But the questions can reveal a deep sense of doubt among adolescents. Questions of existence—suffering, purpose and the presence of a divine reality—are ones that people often reflect on, but they are rarely part of deep conversations with others. Ineffective catechesis programs may be one reason for this absence. Questions of existence are rarely part of deep conversations with others. Ineffective catechesis programs may be one reason. At Benilde-St. Margaret’s School, we are taking a radical approach and throwing out the traditional theology curriculum in junior high in favor of “conversational catechesis.” Seminar-style theology classes allow teachers and students to talk openly about difficult and complex questions of faith. Parish faith formation curricula using this model, partnered with volunteer catechists who are willing to engage in students’ authentic questioning, could be the starting point for truly forming the whole person and nurturing a living faith for the young members of our church. This method should not be new to teachers. Young adults no longer need to memorize historical facts or quotes from lofty literature—they have Google for that. Rather, we need to help our students exercise an ethical conscience, apply creativity and cultivate innovation. Education needs to embrace the muscles of learning so that our students can develop into future leaders for a global world. Unfortunately, the muscles of learning have long been neglected in the study of theology as seen in the high-school curriculum provided by the U.S. Conference of Catholic Bishops. The core curriculum, “Who Is Jesus Christ?,”dives into the dual persons of Jesus and floods students with the incredibly complex teachings of Nestorianism and monophysitism. But the curriculum does little to promote critical thinking and moral development. How can we foster faith in students with merely rote memorization and inaccessible vocabulary? The curriculum does little to promote critical thinking and moral development. How can we foster faith in students with merely rote memorization and inaccessible vocabulary? Like all teachers, catechists must help students strengthen the muscles of learning. This gets more complicated when we begin to talk about faith formation in a parish setting. With classes that meet only once a week and often include unwilling participants, transmitting the faith is already an uphill battle. Conversational catechesis offers volunteer teachers and students the opportunity to build authentic relationships and begin to teach the faith through moments of encounter rather than the dissemination of theory. That’s right. She was 15 years old when she listened to God’s word and changed the world. Conversational catechesis is much like a conversation that bends and turns as young minds think through the abstract landscape of faith. If we simply study Exodus without bringing to the Scripture questions from our own time, we may never understand the relevance and impact that Moses continues to have upon us. We don’t use religious words anymore. That’s a problem. By creating a space where students can ask questions without judgment, teachers in schools and parishes become spiritual companions, walking with young people as they become aware of moments of consolation and desolation in their life. Adult companions need to lean into those experiences of students, rather than shying away from them because they are “uncomfortable” or too difficult to deal with, all the while keeping in mind appropriate boundaries. In October, The New York Times published an op-ed by the religion writer Jonathan Merritt making this same point: “It’s Getting Harder to Talk About God.” It is refreshing to see acknowledgment of this crisis in secular publication, reinforcing the need to reframe how we talk about God and faith. In January, Saint Mary’s Press released a study titled “Going, Going, Gone” that assesses the disaffiliation of young Catholics from the church and explores the reasons they have chosen to step away from their church community. The research indicates that those who have “drifted” away from the church have done so because they perceive a lack of “real world relevance.” A 2017 survey of Benilde-St. Margaret’s students produced similar data, with only 26 percent of junior high students saying that their religious faith is extremely or very important to their daily lives. 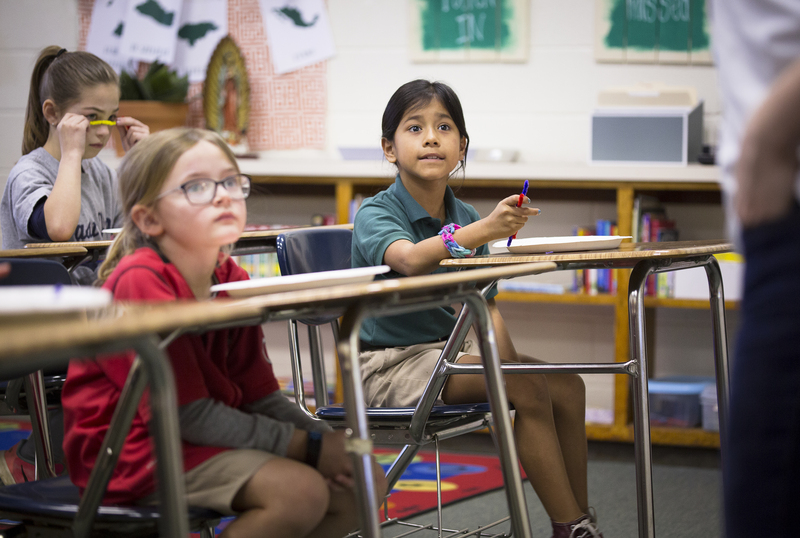 In order to appeal to a young mind, we must employ conversational catechesis in our classrooms, parishes and homes as we teach kids about faith. Understanding God will always be complex, but talking about God should always be easy. Our adults need to model this behavior as we raise a future generation of Catholics. The basic problem of faith is belief. All these things mentioned here are good but will not withstand criticism that primarily uses what appears to be rationale attacks. What has to be done alongside these other things is to show that the attacks are not really rationale. For example, Catholicism is primarily meant for getting us to the next world so any attempt to force it into relevance for this world may not be productive. That does not mean Catholicism is not useful for a better life here but it isn't its primary purpose. As life on this world gets better and better, the next life seem less relevant. For example, the theodicy issue, or why does God allow really bad things to happen to some people is hard to explain to people. It is certainly relevant for this life but for eternity, what happens in this life is trivial in comparison. This is hard to explain to someone when they or someone they knew was the person that was affected. With all due respect, I think you have completely misunderstood the Gospels, and thus the Catholic religion. When you say that "Catholicism is...for getting to the next world" I see very little connection to the entire core of the Catholic faith. The vast majority of the Gospels -with the exception of a few well known pericopes in John, which assume knowledge of the the synoptics anyway- are all about how to act in THIS world. Even the "Last Judgment" (Mt. 25) is all grounded in actions in this life we are living. In Catholicism, the Sacraments -primarily the entire liturgy of the Mass, (cf. "The Eucharist has ended, go forth...")- are about strengthening us for life in this world. Thus, in educating young Catholics, the most effective way in promoting belief would be precisely to engage this world. Remember 1 John 4...not to mention Matthew, Mark, Luke, and John. If there is to be faith in the future, it will depend on connection between the immanent and transcendent; the current disconnect many are experience with the faith is because of a disconnect between transcendent and immanent. Your point of view is news to me because I was continually taught about salvation in my 16 years of Catholic education starting at 6 years old. It has also been mentioned in thousands of homilies I have heard. Without offering eternal salvation, Catholicism has no more relevance than any other well meaning social program. For almost all of history since Christ, nearly all Catholics lead short miserable lives. So the gospels did a lousy job if this life was the objective. A lot of christians go to church because it's their fire insurance. They are afraid of burning in hell instead of going to "heaven". They are motivated by fear rather than by love. Jesus' life and teaching were all about how to live in this world. When he spoke of the kingdom, he said said "Thy Kingdom come, thy will be done ON EARTH as it is in heaven." It is our job to build God's kingdom - on earth. Jesus taught us to love, to love God, to love our neighbors - the two great commandments. If your main focus is your own personal salvation, then you might want to reflect on Matthew 25:31-46. Jesus was quite explicit about who would be damned and who would achieve "salvation". If your main concern is saving your own hide for heaven, then you might want to think about saving the hides of some of those who need help on earth today. Think about loving your neighbor as yourself. That includes poor people, homeless people, hungry people, desperate Latino migrants, Muslim refugees, among others. Anyone who reads this site regularly knows the strong antipathy you have towards helping those whom Jesus wants us to help. “Then the King will say to those on his right, ‘Come, you who are blessed by my Father; take your inheritance, the kingdom prepared for you since the creation of the world. 35 For I was hungry and you gave me something to eat, I was thirsty and you gave me something to drink, I was a stranger and you invited me in, 36 I needed clothes and you clothed me, I was sick and you looked after me, I was in prison and you came to visit me. Option 2: Love is the greatest power for the transformation of reality. (Francis). "Love your enemies." Christ - “In the end ...God exists or does not exist. These are the only two options. Either one recognizes the priority of reason, of creative reason that is at the beginning of all things or one holds the priority of the irrational in as much as everything that functions on earth and in our lives would be only accidental, marginal and irrational result. Reason would be a product or irrationality. One cannot ultimately prove either project. But the great option of Christianity is the option for rationality and the priority of reason. This seems to be an excellent option which shows us that behind everything is a great intelligence to which we can entrust ourselves. Therefore, we can confidently work out a vision of the world based on this priority of reason, on this trust that the creating reason is love and that this love is God” (Benedict). - “By faith (that Christ was God) we understand that the world was created by the word of God, so that what is seen was made out of things which do not appear” 123 Catechism of the Catholic Church. Choose: “Be Pro-Choice.” Don’t drift. Transform your Reality. Commit. - Choose: *Reason over chance. *Love over instinct. *Free will over no will. *Truths that are self-evident. ”that all men are created equal, endowed by their Creator with certain unalienable rights over nonsense. There is no creator. The laws of science brought the universe into existence. There are no truths outside of the laws of science, nor any rights, all of which are just made up by hierarchical authority. *Morality over nonsense. God is dead. There is no morality only rules imposed by judgmental political forces. *Precious child over nonsense. What your experiencing is an evolutionary process to ensure survival of the species like any other sentient species. *Beauty in nature and art over nonsense. Just an experience of the laws of synapses, hormones, genes. *”There is a sense in which we live on, in our influence, and in our genes that we pass on to our children. We have this one life to appreciate the grand design of the universe, and for that I am extremely grateful” (Hawking) over nonsense. Delusional thinking by an Astrophysicist to give meaning to his work and all creation. Neither human existence nor creation have meaning. *The love that comes from a changed heart, from a heart of stone, …turned into …a human heart” (Francis) over nonsense. Change is effected by the laws of science or driven by public opinion. Choose Love as reality beginning with the love of God.. Live a new reality. “Love that will never end … We were created to love and be loved. (Francis)”. Live the Beatitudes. – “See God in all things … Find the sacred in everyday life. (Ignatian Spirituality). Jesus' life and teaching were all about how to live in this world...In order to get to the next world. I don't disagree with anything you said except the implication that seeking salvation is a selfish pursuit. I certainly don't believe that nor have I met anyone who does. I'm sure there are some. If we believe we were created by a Good God to share in the holy eternal life of this Good God, then "salvation" is our purpose as humans. The holiness of God includes the moral dimension of abhorring suffering and evil , and desire for justice.When as a rebuke people say that some Christians use church like an insurance policy, they are being arrogant. God knows each of our hearts; we are all in the same boat here. Do not kid yourself and do not underestimate other people's capacity for being truly spiritual beings. So Cosgrove, don't let it get to you when people miss interpret what you say. No body except an atheistm too in the closest to declare themselves one, is a Christian because that is the only ethical humanism available on earth! .Yes the immanent should reveal the transcendent; our goodness reflecting the good ness of God. That can occur whether one believes or not.Our faith is a faith in transcendence, the hereafter, heaven. if this is too embarrassing for some let the embarrassed shy away from expressing this Christians belief. For us its central ; existence itself is holy, is of God, humanity itself, life itself is created to share in the holiness of existence ; we want life abundantly , and this is Jesus promise., this is his earthly mission ; to safe guard our existence; our made in God's image holiness for which we were created for. And this is why we are Christians . The creed list what we are supposed to believe, the consensus of the important things from tradition In the early Church. Beautiful and moving insight Sheila. ." God is love .. and she who abides in love abides in God, and God in her". That you know this with your own being is a blessing you have received. Thanks for sharing your experience..
Can you substantiate your statement of disagreement from Catholic doctrine? To the authors: Garbage! The Faith ,or Gift, that Jesus left us is a precious inheritance to be preserved and handed, without innovation, from one generation to the next. Any bishop or priest or Catholic educator that is seeking to be popular in lieu of being clear is directing their students down a bleak dead end. Suffering in this life will always exist. Jesus said the poor will always be with us, He directed the woman who was to be stoned to 'sin no more'. He suffered a tortuous death. Teach the expectation of burdens in this life and that Divine Revelation does not answer all questions. (ie We know 'space' exists, but we don't comprehend it). Direct your charges toward the hope of heaven and away from hell. Don't imply that injustices will always be made whole in this life.. Deny the ego, stick to the script, pray for the' mustard seeds' of faith to grow and let the chips fall where they may. Be true to your mission and have faith that God will do the rest. !This is a time to get the facts, later for questioning associating, interpreting etc. Religion for young children, who are just learning how to read, do arithmetic , critical thinking etc.., should be the favorite , easiest and least stressful of subjects, as it is just truly about feeding the sheep the comforting word of God. Bringing them the good news of Jesus Christ .Questions and answers as found in the catechism, bible stories that illustrate the history of salvation; all these suffice to make for a rich ground for faith. A child feels good knowing she knows why she exists! Knowing she has memorized[ yes memorized ] what are actually profound truths from the catechism,. Asking her who is Moses today, is an affront actually. How the heck does she know. She has to rack her brain with news stories to come up with an answer, maybe, A news story that may entail its own indoctrination .Now she is totally removed from her dogmatic religious education .What does that even mean and what has that got to do with teaching her the God so loved the world , he sent Jesus ?Later for deep dives into how to be a Christian today and the game of who is a real Christian today etc. First know what a Christian is , what we believe. the basic theology and basic ethics as Jesus expressed it in the sermon on the mt, and other parables and how ethics has been revealed in the 10 commandments. !I'll bet that if young people are not learning their faith, it is because too much extraneous stuff is being thrown at these kids in religion class in their early formation years. They are being over whelmed and that is not appropriate to being yoked by Jesus Christ. A. God made me to know Him, to love Him, and to serve Him in this world, and to be happy with Him forever in the next. Baltimore Catechism - There are 4 books to the Baltimore Catechism consisting of over a couple hundred questions and answers, all free on Amazon Kindle. When you say “catechism” you are talking about conditioning. Conditioning young minds like this is brainwashing. At least it sounds like brainwashing to me, the way you talk about it. I believe, I know, that children love to talk about such matters from the heart. Stop attempting to brainwash children. It’s evil. Ask them questions, and most of all, be real. Stop focusing on all the rules. It’s not about rules and laws. It’s about LOVE, people. Or don’t you get it?!!! Catechism are not just rules; catechism is basic theology .Yes it is brainwashing; all religious formation is brainwashing. All culture, all education for that matter is brainwashing; minus math and logic and empirical science. If one is a Christian , if one believes, then the way to transmit the faith that one believes in to the next generation is through, well brainwashing. At the start. Later a more mature developed authentic faith can develop with the building blocks of a basic theology. Asking many questions of children. is emotional abuse [imo]. It is disrespect, Adults have trouble knowing right from wrong good and bad.. We are divided over many ethical issues; we grapple as adults with ethics .So to expect kids to have clear answers or any answers on contentious issues is asking too much. They will make things up to shut us up or to please; reading adult cues, if you pry too hard. "hey teacher leave the kids alone!, emotionally". Respect the privacy of their inner still forming tender minds .That shows them love. I agree with Cosgrove. I've had 13 years of formal Catholic education and a lifetime of informal education regarding it. Catholicism is not a democracy. It is what it is. Its history is recorded. It reaches back to Jesus Himself. Now the only real question is, Is He God ? With the exception of a few breaths of intellectual and spiritual fresh air, this is one of the most shallow commentary threads I have ever read on these pages. If this is the best you can do, you are the proof of why we must improve faith formation starting in middle school. I can't even get excited enough to engage with this drivel. More depth, more breadth, more substance, no platitudes and, dare I ask, can you muster an original thought? The Church , by its Divine nature, can only make deductions from Divine revelation. Doctrinal innovations aren't Christian. Clarity is critical. But doctrinal innovation has made innovations. There is absolutely nothing in divine revelation, aka the Scrioturrs about the Immaculate Cinception of Mary or the belief in the continual virginity of Marybirvyhe Assumption of Mary. Scripture rose out of the same Divine Tradition that informs us about Mary. The Old Testament was produced from the Jewish Tradition. The New Testament was produced from the Christian Tradition. Things weren't written down in early Christianity. The new Testament came from oral accounts that were written down a generation or two later. There were over 400 manuscripts (papyrus) floating around and being read in the Eucharistic communities when the Catholic Church, ( long before the split off of the Orthodox) selected the 27 which were defined as Divinely inspired cannon (rule) and this list of manuscripts became the New Testament. The Gospels were first part of oral tradition. We still have Divine Tradition, of which a portion is known as the Bible. Revelation becomes more clear as it is developed through reasoning. Doctrine is never inconsistent with Divine Revelation. It is It's logical deduction. There has always been controversy in the Church. Historically, when it became untenable , it forced the successors of the Apostles, the Bishops,. to decide the argument, consistent with the authority vested in them by Jesus Christ. The Nicene Creed rose out of controversy and came from the Council of Nicaea several years before the Bible was formed . Jesus said He would always be with us.. He said the gates of hell would not prevail against His Church.(. 'Prevail' doesn't not mean there won't be a fight). "dives into the dual persons of Jesus"
This phrase alone is commentary enough on the catechesis of the authors of this article. This article also appeared in print, under the headline "How can children benefit from a more 'conversational' catechesis," in the January 7, 2019 issue. Becca Meagher is a campus minister and theology teacher and Claire Shea is a junior high principal, both at Benilde-St. Margaret’s School, a Catholic college preparatory school in St. Louis Park, Minn. Ms. Meagher also serves on the board of directors at Saint Mary’s Press.